You can check out Melanie's cool blog HERE - Love her photos! By the way, she just started her own photography business and is already making quite the splash - Hooray Melanie! p.s. Did I forget to mention I won Happy Jax's "Best of Summer" contest - Check out that post HERE. This photo might be one of my favorites from the past month. 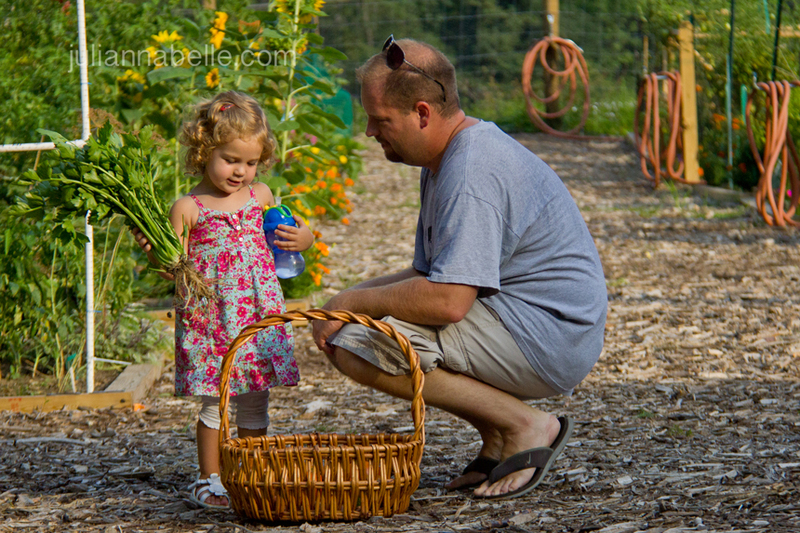 It's Daddy showing Julianna the newly picked veggies from our garden. She is so interested in this celery and what's in the basket. I love the lighting in this one too. When Brian said "Let's go to the Community garden" that night, I grabbed my camera because of the nice lighting later in the day up there. I agree, this is such a sweet capture! I love her little shirt dress! Those are great colors for her! Love the lighting in this shot! such a cute blog and family you have!